The Polytechnic School in Pasadena is one of Southern California’s finest private schools. Located adjacent to the Caltech campus, it was designed by Myron Hunt and Elmer Grey in 1906. Although spare and modest, this is an early example of a progressive school type that was later popularized by California modernists in the mid-twentieth century. The buildings are fully oriented around common gardens, and classrooms are interconnected through an open-air arcade with teaching spaces opening out to private patios. 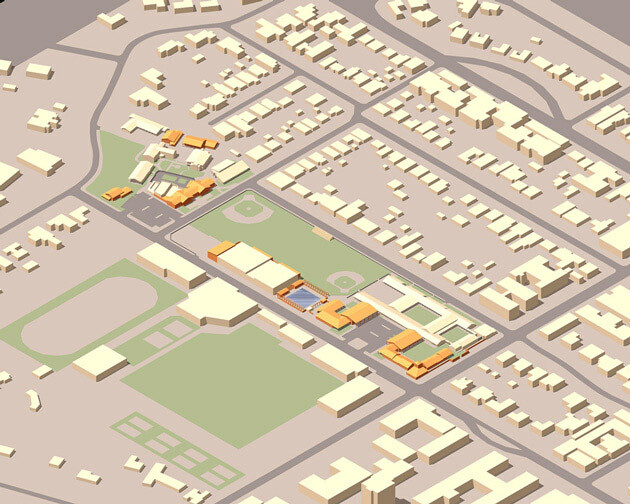 Moule & Polyzoides prepared a Strategic Master Plan that analyzes the school’s current resources and proposes patterns of future growth for the campus based on long-term academic objectives. The design emphasizes the definition of an open space and landscape framework supported by transportation and other infrastructure improvements and implemented by the design of individual projects.